Give your garage floors new life by making them more durable and transforming their look with the right floor coating. The coating protects the concrete from wear and damage. The concrete itself is porous, so it allows in water and corrosive chemicals like oil and brake fluid. Over time, the concrete weakens, and those tiny pores become larger and give way to cracks and other damage. Our garage floor coatings create a barrier between the concrete and these damaging elements. You can feel confident that the concrete foundation is protected for many years to come. 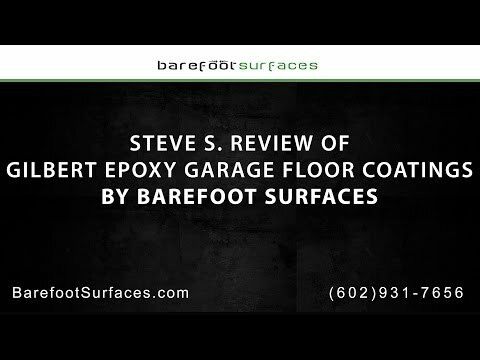 The professionals at Barefoot Surfaces are experts in garage floor coatings. Our workmanship is impeccable, and we use only the highest-quality materials that are carefully selected for the needs of your floors. That means that your floor coatings will last for many years to come, providing consistent performance and creating a consistent look. You’ll save money on floor maintenance and will better enjoy the look of your concrete floors. Stained concrete offers a beautiful and long-lasting option that will elevate the look of your home. These floors have a rich hue with interesting natural patterns. They look almost like someone has painted the floors by hand, including contrasting shadows and highlights to give the floor depth and interest. You can choose from several colors for your floors, and you can do just one room in your home or all the rooms. The polished finish has a glossy sheen that is sophisticated and luxurious. Not only do stained concrete floors look great, but they are also durable and easy to maintain. These floors stand up to all kinds of wear and tear, including heavy foot traffic, spills, moving furniture, and pet traffic. They are not easily scratched, and they are resistant to water damage. All you need to do is sweep and mop them to keep them clean and looking great. Stained concrete floors also help bring down energy costs. These floors will help to keep your home cooler during the summer months, when the temperatures can reach triple digits in Arizona. Decorative concrete overlays transform that dull gray surface into something unique and beautiful. These overlays have rich colors and interesting depths that make for floors like you won’t see in any other kind of material. The professionals at Barefoot Surfaces are experts at installing decorative concrete overlays, and we have a well-earned reputation in the community for our quality workmanship and our exceptional service. Let us show you what we can for you! Metallic epoxies create an alluring and unique finish for your floors. These epoxies have many different colors and patterns, allowing you to get the look you want. Some have noticeable chips and metallic flecks, while others have a more milky appearance with a metallic shimmer. Barefoot Surfaces are the experts in epoxy floor coatings, including metallic epoxies. We provide some of the best metallic epoxy coatings in the area, and we have a reputation for exceptional service and workmanship. Concrete floors are often used in garages and other work spaces, which makes them vulnerable to corrosion and staining from the equipment, foot traffic, and chemicals that are common in these spaces. Sealing the concrete floors can protect them from damage and make them look nicer, creating a more professional or polished image for the space. Sealed concrete does not include the use of decorative stains or patterns. It adds a glossy, clear finish that protects the surface and extends the life of your concrete. Sealing is a cost-effective means of protecting your concrete floors and improving their look. Barefoot Surfaces has been sealing concrete for many years, and it has a reputation in the community for exceptional results. Our expert technicians provide the highest quality workmanship while also delivering some of the best customer service. We seal all types of concrete floors, including those in your garage or your home or business. You can get the same benefits in your kitchen, sunroom, or any other room of your home or business. Barefoot Surfaces is proud to be a certified Slide-Lok garage cabinet installer. The Slide-Lok cabinet system features a modular design that allows multiple pieces to be stacked and rearranged as needed to better organize tools and materials and to best suit your preferences for design or access. The cabinets are easy to assemble and be configured in multiple ways for a truly custom look. The Slide-Lok cabinets are made of real wood, which gives them a nicer look and makes them more durable and longer-lasting. In fact, these cabinets have a lifetime warranty. The cabinets have a patented dovetail construction, which saves on labor costs and ensures that your cabinets are ready to go quickly so you can take control of your space. Combine the Slide-Lok garage cabinet system with a beautiful epoxy floor covering and you’ll create a gorgeous garage that looks more like a showroom than a workspace. Clean up will be a breeze, and you’ll be able to quickly find whatever tools or supplies you need. You can finally get rid of that clutter from holiday decorations, kitchen gadgets you never used, gardening supplies, and power tools. Everything will finally have its own place, and you’ll never have to waste time searching for items again. I Highly Recommend Barefoot Surfaces! Our proprietary process has 5 coats that go into making the ultimate floor, one that can stand up to the stress and wear of anything from home DIY projects to industrial level uses. Our coating consists of a primer coat, a color coat, a full chip coat, and two coatings of clear polyespartic for unbeatable protection.